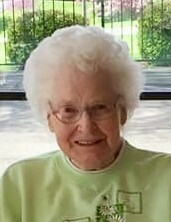 Carmen “Jane” Duncan 85, went to be with her Lord and Savior on Thursday, January 24, 2019. She was a resident of Springhurst Health and Rehab in Louisville, Kentucky. She was born August 23, 1933 to the late Charles Harmon and Lula Mae Ellis. Jane is preceded in death by her loving husband of 48 years, Joseph Sylvester Duncan whom she married March 29, 1952. She is also preceded in death by a sister, Norma Beverly, 6 brothers, Donald Ellis, Charles Ellis, Floyd Ellis, Roger Ellis, Frank Ellis and her twin brother Gene Ellis. Jane is survived by her son, Donald Ray (Glenna) Duncan of Portsmouth and her daughter, Mary Jane Titus of Louisville, Kentucky. 4 grandchildren, 5 step-grandchildren, 3 great grandchildren and 9 step-great grandchildren and 5 great-great grandchildren. She is also survived by her sister Joyce Kelly of Moraine, Ohio, and brother, Carl (Linda) Ellis of Dayton, Ohio. Sisters-in-law, Helen Ellis of Lucasville, Shelva Ellis of Kettering, Ohio, Chris Ellis of West Manchester, Ohio, and Georgia Ellis of Otway. Brothers-in-law George Duncan of California, Guy (Joyce) Duncan of Lancaster, Ohio, Homer Duncan of Rubyville, and Terry (Patty) Duncan of Lucasville. Many nieces, nephews, friends and very special friends, Sharon Lee of Portsmouth, Katrina Chesser her caregiver and friend Sarah Sawyer both of Springhurst Health and Rehab, Louisville, Kentucky. Jane worked for many years at Williams Mfg. Co. and is retired from Southern Ohio Medical Center, working in housekeeping. She was a member of Mabert Road Baptist Church. The last five years she has lived in Louisville, Kentucky, where she resided at Springhurst Health and Rehab. She made many new friends and embraced her community by participating in many activities. A few of her favorite being reading her Bible, working jig saw puzzles, painting and going to the Dollar Tree. Funeral services will be held 11:00 AM Monday, January 28, 2019 at Rubyville Community Church with Pastor Calvin Ray Evans officiating and interment in Sunset Memorial Gardens in Franklin Furnace. Friends may call from 2 to 5:00 PM on Sunday at the Roger W. Davis Funeral Home in West Portsmouth and one hour prior to the service at the church on Monday. Condolences may be sent to www.rogerwdavisfuneralhome.com.